Teak Outdoor Furniture, These days, teak wood, with its Latin name Tectona Grandis, is tropical hard wood that is usually to be produce as furniture. The wood has many characteristics that becomes its benefits one in indoor our outdoor furniture. It has rich character of the wood color, oil content to resist from rot and other defect and the strength to withstand in any weather evening the extreme one. In term of teak outdoor furniture, the wood can be placed in any outdoor settings such as garden, lawn, patios, porches, decking or terraces. Those areas are usually for private living spaces owned by ordinary people. However, luxury homes such as mansions or celebrity homes do teak outdoor furniture as well as they know the benefit of having teak in their dwellings. Teak can complete green areas for natural impression of functional decoration. Besides, hospitality sectors such as hotels, resorts, lodgings, villas, or restaurants use teak as their furniture as well. 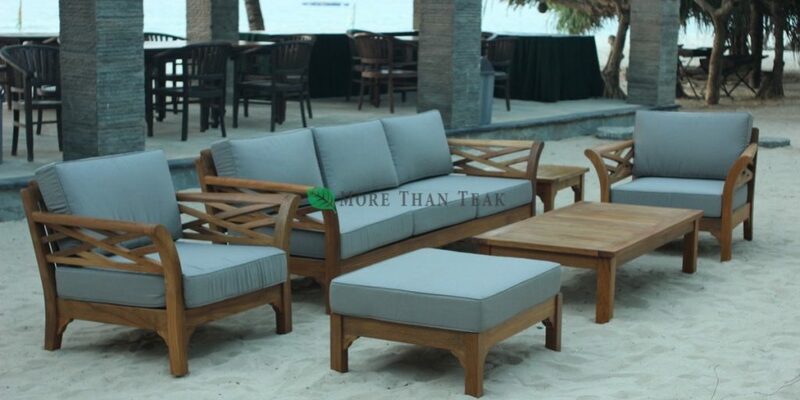 Teak outdoor furniture –almost- always comes in unfinished product. The reason is that the exposure of the rich honey brown color of the wood and its straight texture are the main interest as well as the quality and durability. With the finest teak quality for outdoor, it looks stunning, beautiful, and long lasting even when it is abandoned for a while. Thanks to teak outdoor furniture, you would easily do outdoor activities in a comfort and stylish way. Anytime you want for relaxing book reading outside, you could have it on your teak daybed or deep seating as it has beauty, luxury, not to mention comfort at the first place. Hosting outdoor BBQ or dinner parties would not be great if there is no teak as the seating furniture. Or, you could have relaxed seating moment while keeping the eyes on children outdoor playing. This entry was posted in article and tagged Teak Outdoor Furniture.